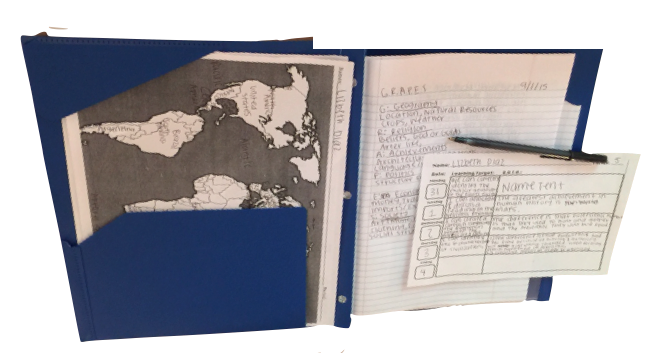 A large part of your success in this class (and in college history classes) depends on keeping a neat and orderly notebook. Your notebook (folder with pockets and brads) is your lifeline in this class. It must be brought every day. This is where you will take your notes (like in college!) and keep any hand-outs you are given. Notes and blank paper are to be attached to the brads in the middle. Class hand-outs in the front pocket, extra blank lined paper in the back pocket. If you miss a day when we take our notes, it is your responsibility to get with a partner and copy them into your notebook. It is very important that you bring your notebook with you every day, and that you keep it neat and in order. I take between one and two notebook grades per six weeks. If you have your notebook set up like this, the grade will be a 100. If not, a ZERO.